This poor girl got really super upset in the middle of the run and she threw up. And unfortunately she threw up in the pit of despair. In the Great Big Story interview, Kirk Fogg reveals that some of the writers actually got a bit of a thrill out of dressing up as the temple guards on occasion so that they could scare the kids on the show. I guess you get your kicks where you can. 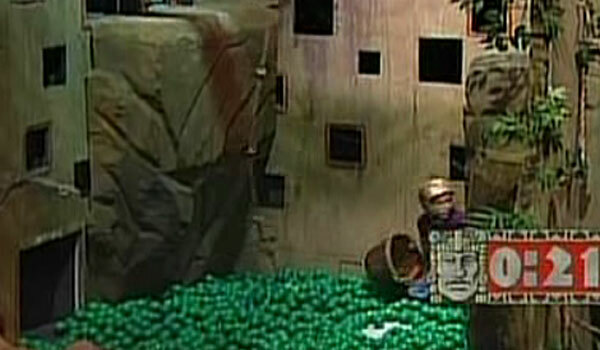 We may never get to see the ickiest moment in Legends of the Hidden Temple, but if you are still a kid at heart, Nickelodeon announced a brand new block of programming called The Splat a few months ago that features a ton of repeats of nineties favorites, including Legends of the Hidden Temple. And if the goofy game show isn’t your thing but animation is, other programs like Rugrats, Ren & Stimpy, CatDog and more are also available from 10 p.m.- 6 a.m. during the week. If you aren’t feeling like reliving your youth again, here’s when the rest of your favorites are returning to the TV schedule this winter.